Dr. Dale E. Klein rejoined The University of Texas System in January of 2011 as Associate Vice Chancellor for Research in the Office of Academic Affairs. In April of 2010, after serving eight and a half years as Presidential Appointee, Dr. Klein returned to Texas from Washington, D.C., working at The University of Texas at Austin as the Associate Director of The Energy Institute, Associate Vice President for Research, and a Professor of Mechanical Engineering (Nuclear Program). Dr. Klein was sworn into the U.S. Nuclear Regulatory Commission in 2006, and was appointed Chairman by President George W. Bush, serving in that role from July 2006 to May 2009. 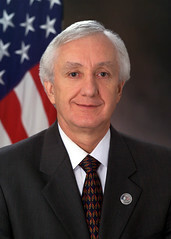 As Chairman, Dr. Klein was the principal executive officer and official spokesman for the NRC, responsible for conducting the administrative, organizational, long-range planning, budgetary, and certain personnel functions of the agency. Additionally, he had the ultimate authority for all NRC functions pertaining to an emergency involving an NRC licensee. The remainder of this term was as Commissioner of the NRC from May 2009 to March 2010. Before joining the NRC, Dr. Klein served as the Assistant to the Secretary of Defense for Nuclear, Chemical and Biological Defense Programs. He was appointed to this position by President George W. Bush and confirmed by the Senate in 2001. In this position, he served as the principal staff assistant and advisor to the Secretary of Defense, Deputy Secretary of Defense, and the Under Secretary of Defense for Acquisition and Technology for all policy and planning matters related to nuclear weapons and nuclear, chemical, and biological defense. Previously, Dr. Klein served as the Vice-Chancellor for Special Engineering Programs at The University of Texas System and as a professor in the Walker Department of Mechanical Engineering (Nuclear Program) at The University of Texas at Austin. During his tenure at the university, Dr. Klein was Director of the Nuclear Engineering Teaching Laboratory, Deputy Director of the Center for Energy Studies, and Associate Dean for Research and Administration in the College of Engineering. Honors and awards Dr. Klein has received include Fellow of the American Society of Mechanical Engineers and the American Nuclear Society, Engineer of the Year for the State of Texas, the University of Missouri Faculty-Alumni Award, and the University of Missouri Honor Award for Distinguished Service in Engineering. A native of Missouri, Dr. Klein holds a doctorate in nuclear engineering from the University of Missouri-Columbia. He has published more than 100 technical papers and reports, and co-edited one book. He has made more than 400 presentations on energy and has written numerous technical editorials on energy issues that have been published in major newspapers throughout the United States.